While there are various formulations of aviation gasoline (AVGAS), only three grades are conventional: 80/87, 100LL, and 100/130. 100LL is the most widely available in the United States. AVGAS is dyed with a faint color for grade identification: 80/87 is dyed red; 100LL is dyed blue; and 100/130 is dyed green. All AVGAS grades have a familiar gasoline scent and texture. 100LL with its blue dye is sometimes difficult to identify unless a fuel sample is held up against a white background in reasonable white lighting. Aircraft piston engines certificated for grade 80/87 run satisfactorily on 100LL if approved as an alternate. The reverse is not true. Fuel of a lower grade should never be substituted for a required higher grade. Detonation will severely damage the engine in a very short period of time. Detonation, as the name suggests, is an explosion of the fuel-air mixture inside the cylinder. During detonation, the fuel/air charge (or pockets within the charge) explodes rather than burning smoothly. Because of this explosion, the charge exerts a much higher force on the piston and cylinder, leading to increased noise, vibration, and cylinder head temperatures. The violence of detonation also causes a reduction in power. Mild detonation may increase engine wear, though some engines can operate with mild detonation regularly. However, severe detonation can cause engine failure in minutes. Because of the noise that it makes, detonation is called “engine knock” or “pinging” in cars. When approved for the specific airplane to be flown, automobile gasoline is sometimes used as a substitute fuel in certain airplanes. Its use is acceptable only when the particular airplane has been issued a Supplemental Type Certificate (STC) to both the airframe and engine. Jet fuel is a kerosene-based fuel for turbine engines and a new generation of diesel-powered airplanes. Jet fuel has a stubborn, distinctive, non-gasoline odor and is oily to the touch. Jet fuel is clear or straw colored, although it may appear dyed when mixed with AVGAS. Jet fuel has disastrous consequences when introduced into AVGAS burning reciprocating airplane engines. A reciprocating engine operating on jet fuel may start, run, and power the airplane for a time long enough for the airplane to become airborne only to have the engine fail catastrophically after takeoff. Figure 2-9. An AVGAS fuel filler nozzle is straight with a constant diameter. Figure 2-10. 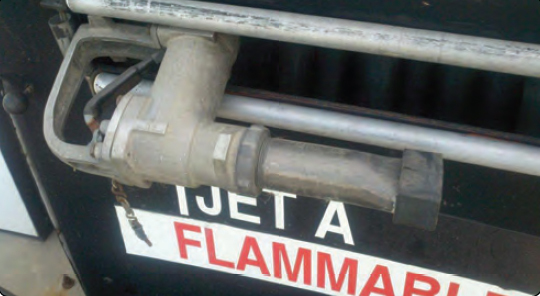 A jet fuel filler nozzle is flared at the end to prevent an inadvertent insertion into an AVGAS fuel tank. Using the proper, approved grade of fuel is critical for safe, reliable engine operation. Without the proper fuel quantity, grade, and quality, the engine(s) will likely cease to operate. Therefore, it is imperative that the pilot visually verify that the airplane has the correct quantity for the intended flight plus adequate and legal reserves, as well as inspect that the fuel is of the proper grade and that the quality of the fuel is acceptable. 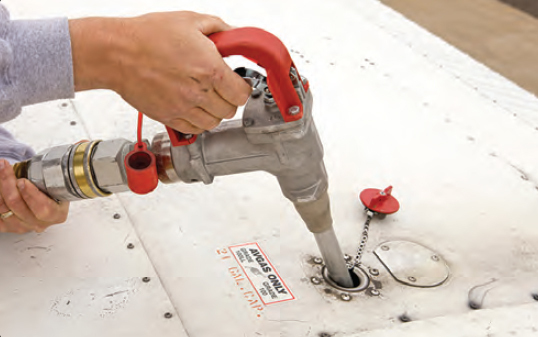 The pilot should always ensure that the fuel caps have been securely replaced following each fueling. Many airplanes are very sensitive to its attitude when attempting to fuel for maximum capacity. Nosewheel or main landing gear strut extension, both high as well as low, and the slope of the ramp can significantly alter the attitude of the aircraft and therefore the fuel capacity. Always positively confirm the fuel quantity indicated on the fuel gauges by visually inspecting the level of each tank. Figure 2-11. Evidence of fuel leakage can be found along rivet lines. Checking for water and other sediment contamination is a key preflight item. Water tends to accumulate in fuel tanks from condensation, particularly in partially filled tanks. Because water is heavier than fuel, it tends to collect in the low points of the fuel system. Water can also be introduced into the fuel system from deteriorated gas cap seals exposed to rain or from the supplier’s storage tanks and delivery vehicles. 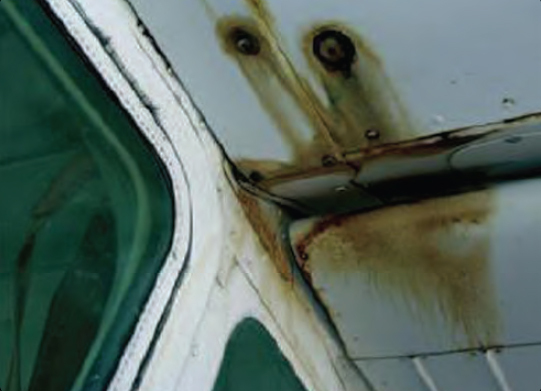 Sediment contamination can arise from dust and dirt entering the tanks during refueling or from deteriorating rubber fuel tanks or tank sealant. Deteriorating rubber from seals and sealant may show up in the fuel sample as small dark specks. The best preventive measure is to minimize the opportunity for water to condense in the tanks. If possible, the fuel tanks should be completely filled with the proper grade of fuel after each flight, or at least filled after the last flight of the day. The more fuel that is in the tanks, the less room inside the tank exists for condensation to occur. Keeping fuel tanks filled is also the best way to slow the aging of rubber fuel tanks and tank sealant. Sufficient fuel should be drained from the fuel strainer quick drain and from each fuel tank sump to check for fuel grade/color, water, dirt, and odor. If water is present, it is usually in bubble or bead-like droplets, different in color (usually clear, sometimes muddy yellow to brown with specks of dirt), in the bottom of the sample jar. In extreme water contamination cases, consider the possibility that the entire fuel sample, particularly if a small sample was taken, is water. If water is found in the first fuel sample, continue sampling until no water and contamination appears. Significant and/or consistent water, sediment or contaminations are grounds for further investigation by qualified maintenance personnel. Each fuel tank sump should be drained during preflight and after refueling. The order of sumping the fuel system is often very important. Check the AFM/POH for specific procedures and order to be followed. Checking the fuel tank vent is an important part of a preflight assessment. If outside air is unable to enter the tank as fuel is drawn into the engine, the eventual result is fuel starvation and engine failure. During the preflight assessment, the pilot should look for signs of vent damage and blockage. Some airplanes utilize vented fuel caps, fuel vent tubes, or recessed areas under the wings where vents are located. The pilot should use a flashlight to look at the fuel vent to ensure that it is free from damage and clear of obstructions. If there is a rush of air when the fuel tank cap is cracked, there could be a serious problem with the vent system. Aviation oils are available in various single/multi-grades and mineral/synthetic-based formulations. It is important to always use the approved and recommended oil for the engine. The oil not only acts as a lubricant but also as a medium to transfer heat as a result of engine operation and to suspend dirt, combustion byproducts, and wear particles between oil changes. Therefore, the proper level of oil is required to ensure lubrication, effective heat transfer, and the suspension of various contaminators. The oil level should be checked during each preflight, rechecked with each refueling, and maintained to not have the oil level fall below the minimum required during engine operation. During the preflight assessment, if the engine is cold, oil levels on the oil dipstick show higher levels than if the engine was warm and recently shutdown after a flight. When removing the oil dipstick, care should be taken to keep the dipstick from coming in contact with dirty or grimy areas. The dipstick should be inspected to verify the oil level. Typically, piston airplane engines have oil reservoirs with capacities between four and eight quarts, with six quarts being common. Besides the level of oil, the oil’s color provides an insight as to its operating condition. Oils darken in color as the oil operating hours increase—this is common and expected as the oil traps contaminators; however, oils that rapidly darken in the first few hours of use after an oil change may indicate engine cylinder problems. Piston airplane engines consume a small amount of oil during normal operation. The amount of consumption varies on many factors; however, if consumption increases or suddenly changes, qualified maintenance personnel should investigate. It is suggested that the critical aspect of fuel and oil not be left to line service personnel without oversight of the pilot responsible for flight. While line personnel are aviation professionals, it is the pilot who is responsible for the safe outcome of their flight. During refueling or when oil is added to an engine, the pilot must monitor and ensure that the correct quantity, quality, and grade of fuel and oil is added and that all fuel and oil caps have been securely replaced.